Today, the Bureau of Labor Statistics released state employment and unemployment data for the month of February. The report points to a mostly steady improvement in the economy across the United States. Over the last year, states saw moderate gains in employment and declines in the unemployment rate which, coupled with a growing labor force, indicate genuine labor market improvements—improvements that must continue in order to achieve full employment. From November 2015 to February 2016, 42 states and the District of Columbia gained jobs. The states with the largest percentage gains were Hawaii (+1.3 percent), Idaho (+1.1 percent), and Washington (+1.0 percent). Seven states experienced declines over the same time frame with North Dakota (-1.5 percent), Wyoming (-0.9 percent), and West Virginia (-0.4 percent) still coping with the impact of lower energy prices on their energy sectors. 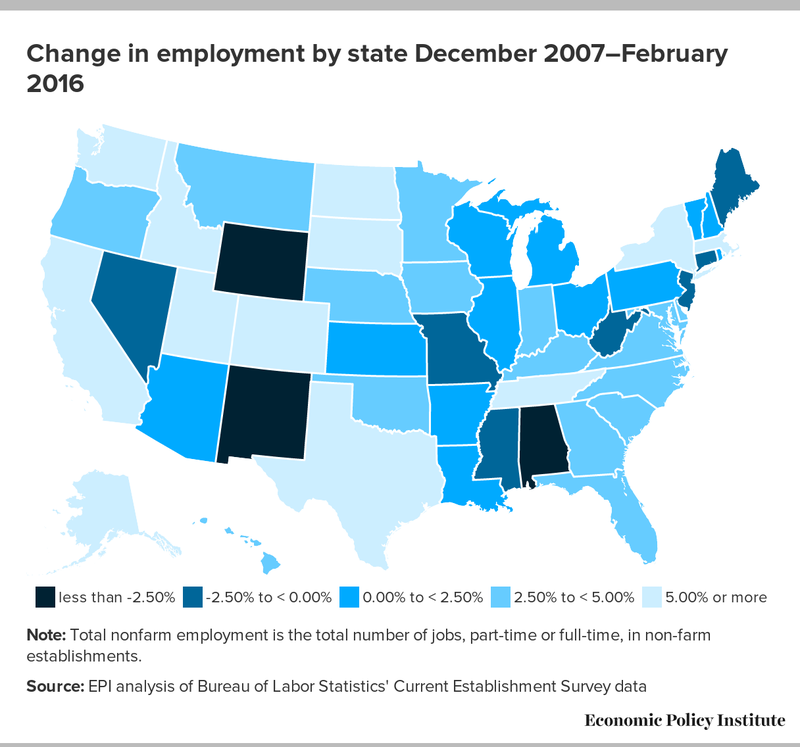 Meanwhile, one state, Nebraska, saw no change in employment. 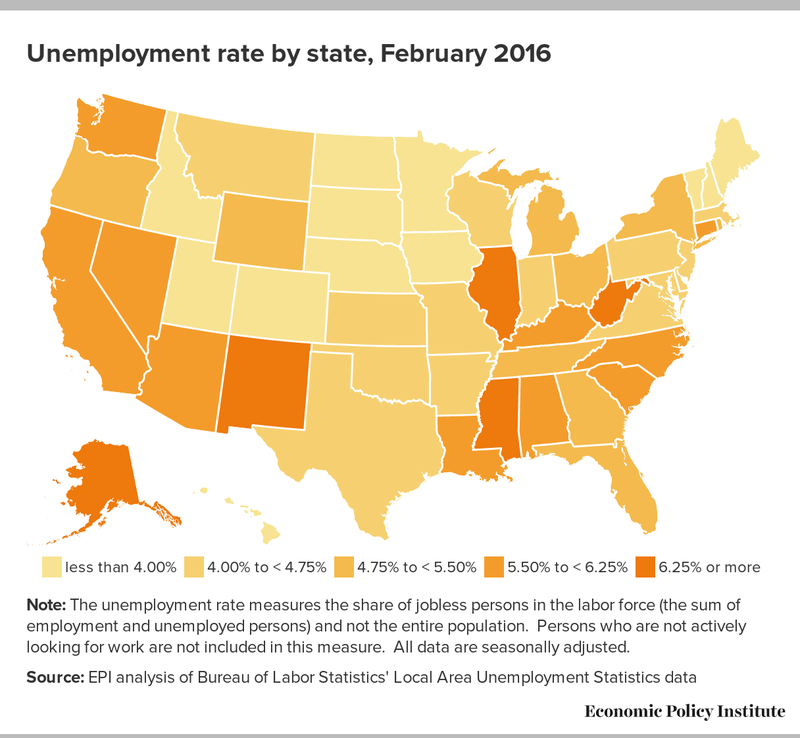 From November 2015 to February 2016, unemployment rates fell for 29 states and the District of Columbia, and remained unchanged for nine states. The largest improvements in unemployment rates occurred in Oregon (-0.8 percentage points), Tennessee (-0.7 percentage points), and Arkansas and New Jersey (both -0.6 percentage points). These states also experienced gains in their labor force, so the positive trends in the unemployment rate are unambiguously good news—the result of more people are finding jobs, and not dropping out of the labor force, as has been a concern for a good part of this recovery. In the states where unemployment rose slightly (0.1 to 0.2 percentage points), most also saw their labor forces increase, generally indicating that these changes were not especially troublesome. The exception was Wyoming, where unemployment rose by 0.7 percentage points and the labor force shrank by 0.8 percent. Again, this is largely the result of price pressures forcing job cuts in the energy sector, highlighting the risk of a dependence on few industries in an economy. Regardless, Wyoming’s unemployment rate of 5.0 percent currently sits just 0.1 percentage point above the national average. The Federal Reserve’s recent decision to leave interest rates unchanged will, for now, keep the labor market moving in the right direction. But state and federal lawmakers have another policy tool at their disposal to help speed the recovery that has been underutilized since the initial 2009 American Recovery and Reinvestment Act: fiscal stimulus. In the years since the Recovery Act, fiscal austerity at the federal and state levels has stymied faster recovery and left state and local government employment 528,000 jobs below its prerecession jobs peak. Lawmakers still have the ability to boost growth and bring back jobs by making smart public investments. The Congressional Progressive Caucus recently published their budget proposal that explains how we can use fiscal stimulus to boost growth, both in the short- and long-terms, while making long-needed investments in education, infrastructure, and childcare. The employment and labor force trends across the states generally indicate that the economy is on the right path. It’s time to make investments that will get us to full economic health, where regular workers see robust wage growth and those who had dropped out of the labor force (due to a lack of job opportunities) can find work again.